See also Flowers for Algernon. 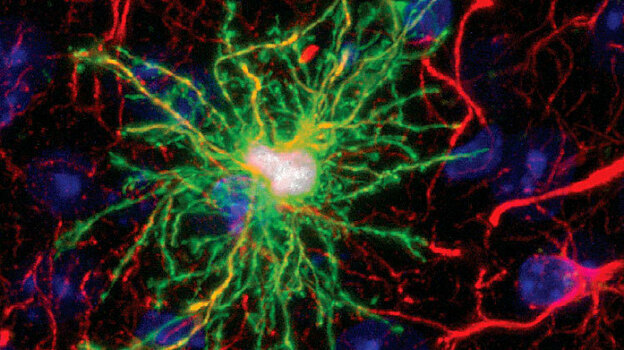 Human astrocytes are larger and more complex than those of infraprimate mammals, suggesting that their role in neural processing has expanded with evolution. To assess the cell-autonomous and species-selective properties of human glia, we engrafted human glial progenitor cells (GPCs) into neonatal immunodeficient mice. Upon maturation, the recipient brains exhibited large numbers and high proportions of both human glial progenitors and astrocytes. The engrafted human glia were gap-junction-coupled to host astroglia, yet retained the size and pleomorphism of hominid astroglia, and propagated Ca2+ signals 3-fold faster than their hosts. Long-term potentiation (LTP) was sharply enhanced in the human glial chimeric mice, as was their learning, as assessed by Barnes maze navigation, object-location memory, and both contextual and tone fear conditioning. Mice allografted with murine GPCs showed no enhancement of either LTP or learning. These findings indicate that human glia differentially enhance both activity-dependent plasticity and learning in mice. This type of research is very exciting, but also makes me quite sad. It seems clear that unless we destroy ourselves, in 100 years we will engineer humans with vN-level intellect and Bolt-level athleticism, and those people will be AVERAGE. I may even be alive when the first of these people reach adulthood. Steve, you might be alive as well. In your lifetime, you may go from elite academician to dull-witted fossil. I always find the inference that these types of experiments yield 'more intelligent' animals a bit dubious. What these types of studies show are enhanced LTP and memory acquisition. However, intelligence is more about discrimination and pattern recognition than knowledge acquisition. Unnaturally enhanced acquisition without similar extinction (LTD) seems more like it would disrupt homeostatic mechanisms and result in wider swings? It's not good control. Example: Babies are really, really good at picking things up. They can hear sounds that many adults cannot; however, I would hazard to say that they are not very intelligent! It's only as they refine their priors about the environment that they start to become 'intelligent'. Why would that make you sad? This experiment is not using the more specialized GPC, but in stead the less differentiated iPS cells - allowing them to differentiate into misc cell types, including astroglia. No attempts at psychometrics on the monkeys yet, but the cells thrive and integrate. One does wonder about the prospect of farming iPS from gifted humans, and transplanting them into the heads of other brave (or at least incapacitated) homo sapiens. Sucking brains from the virtuous, the next big frontier of nootropics? > In your lifetime, you may go from elite academician to dull-witted fossil. That'll happen regardless: we call it 'aging'.